The Pie Hole: Post Pump Pleasantries. | | Quiet Lunch. The Pie Hole: Post Pump Pleasantries. We’ve got a good one for you today. 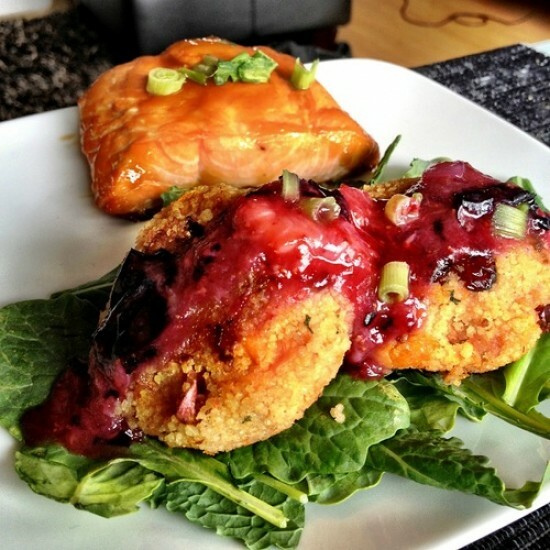 Poached from Fit Men Cook, this recipe for sweet potato-couscous & dried orange cranberry mini-cakes topped with mashed mixed berries on fresh Kale with Hoisin glazed salmon sounds extremely difficult to say (and read) all at once but you’ll probably get over that once you try it. It is supposedly a great post-workout meal! Courtesy of Fit Men Cook. Take a few wedges of sweet potato or yam and steam or microwave them until soft. Dry the sweet potato with a paper towel and with a fork, mash it in a bowl. Add couscous to the mixture and mix. Also, add diced green onion and dried cranberries. Mix. Form small patties with your hands. Lightly spray skillet with olive oil and put on low heat. Add the patties to the skillet and brown each side. Remove and plate. For sauce, mash mixed berries and organic raw honey, red onion, splash of garlic & salt, pepper. Mix and add as topping to mini-cakes.